Cut the shortening into the salt and flour until it has the texture of corn meal. For this, it helps to have a pastry cutter, available at most grocery stores. Add water until the mix is doughlike. It's best to err on the side of dryness, but if you get it too wet you can simply add water. Peel and dice the vegetables, putting them in a large bowl. Mix with the meat. Add salt and pepper to taste. Roll out the crust on a lightly floured surfact as you would a pie crust, only more oblong than round. Put about one pound of filling on one half of the crust. Dip your finger in some water and make a line of moisture around the filling. Flip the other half of the crust over the filling and press it down over the line of moist dough. Crimp the edges, getting fancy if you wish. Poke the crust 3-4 times with a fork and place on an ungreased baking sheet. Bake for 20 minutes at 450 degrees Fahrenheit. Reduce heat to 350 degrees F and bake for another 40 minutes. Blend lard into flour. Add suet, then cold water. Add 1/2 inch layer of finely chopped potatoes seasoned with salt and pepper, then a thin layer of sliced turnips, followed by a very fine layer of chopped onion. Cover this with part of the beef and pork mixture. Fold dough over, crimping the edges. Slit the top, and place on a greased cookie sheet. Bake at 400 degrees Fahrenheit for one hour, or until the crust is golden brown. Blend the shortening into the flour. Add water, and blend with a fork until it holds together. Shape into a ball. If you want, you can chill it here until it is ready for use. Divide into 6 pieces, rolling each on a floured board. Add the filling. Seal the edges with water. Be creative, either folding or pinching the edges; being either artistic or utilitarian, according to your nature. Slit the top. Flute the edges. Bake on a lightly greased tin for 12-15 minutes at 400 degrees F, then for another 30-45 minutes at 375 degrees F.
Sift the flour and salt. Cut in Crisco for the pie crust. Add water and blend with a fork until it holds together. Shape into a ball. You can chill it here until the rest of the ingredients are prepared. Mix it all together thoroughly. Divide into 6 roughly equal servings, about one cup each. Add a teaspoon of butter on the top of each before adding it to the dough. Take the dough out of the refrigerator, and divide into 6 pieces, slightly oblong. Roll each on a floured board and add the filling. Seal the edges with water, folding or crimping the edges. Don't forget to slit the top. Flute the edges, and bake on a lightly greased tin for 12-15 minutes at 400 degrees F, then for another 45 minutes at 375 degrees F, or until the crust is golden brown. Note: Feel free to add your own touches. Add some garlic, oregano, or other spices, if you like. The real key is in making the dough correctly. The amount of water will depend upon the humidity. Using round steak cut in quarter-inch cubes instead of the ground chuck is a nice touch. In cubing the meat and the potatoes, it is best to use small, uniform cubes. Cut the shortening into flour and salt. Add water. Mix and knead until well blended. Form into 4 balls, and chill in the refrigerator for at least an hour. Roll in an 8-inch circle, slightly oblong in shape. Use plenty of flour while rolling out. * The suet is used with the lean steak, and can be traded off to the fat content of the ground beef. Mix the filling together in a large bowl. Roll out the dough, and brush the edges with milk. Put one cup of filling onto one side of each crust, and fold over. Seal the edge by pressing with a fork. Place onto a cookie sheet. Cut a half-inch slit in each to allow steam to exit, and brush the top with milk. Bake on the bottom shelf of an oven preheated to 400 degrees F for 25 minutes, then move to the middle shelf for 20 minutes. Remove from the oven, and cover with a clean towel. Allow to cool for at least 15 minutes before eating. Makes 4 pasties. This recipe comes from its home among the miners of Cornwall. For a beef and potato pasty, make a paste as for pies (but not quite as rich), and roll out the size of a tea plate, slightly thicker than for pie. Now slice a layer of potatoes on it, 1 onion, and a layer of finely cut raw steak. I use cheaper cuts for this. Season with pepper and salt, then fold together as you would a turnover, and bake 45 minutes in a slow oven. 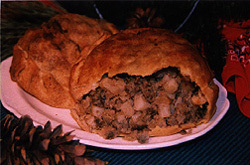 A turnip pasty is made in the same way only never combine turnips with onions or potatoes, simply turnips and beef. A beef pasty is composed of finely cut beef and parsely or an onion. Pasties may be eaten hot or cold and are therefore convenient where a hearty meal must be transported. Immigrants from Cornwall who flocked to the Upper Peninsula to work in the copper and iron mines in the nineteenth century brought the pasty or "tiddy oggie" with them from the old country. Carried deep within the mine in the morning, pasties could be eaten like sandwiches and made a convenient and hearty meal. There are many different variations found throughout the Upper Peninsula, including those that contain pork, ground beef, venison, rutabagas, carrots, etc. In a large bowl, combine the flour, butter, and salt. Blend ingredients well, and add water one teaspoon at a time, to form a dough. Toss mixture until it forms a ball. Kneed the dough lightly against a smooth surface using the heel of one hand to distribute the fat evenly. Form into a ball, dust with flour, wrap in wax paper, and chill for a half an hour or so. Combine all of the ingredients in a large bowl. Divide the dough into 6 pieces, and roll one of the pieces into a 10-inch round on a lightly floured surface. Put 1 1/2 cups of filling on half of the round. Moisten the edges and fold the unfilled half over the filling to enclose it. Pinch the edges together to seal them, and crimp them decoratively with a fork. Transfer the pasty to a lightly buttered baking sheet, and cut several slits in the top. Roll out and fill the remaining dough in the same manner. Bake in a preheated oven for a half an hour at 350 degrees F. Put a teaspoon of butter through a slit in each pasty and continue baking for another half an hour. Remove from the oven, cover with a damp, clean towel. Cool for 15 minutes before serving. Makes 6 pasties. To make the crust, cut shortening into flour and salt, until it looks like meal. Add enough water so that it holds together, but no more than necessary. Roll out as you would for a pie crust, and cut into 9-inch circles. Mix all of the filling ingredients, seasoning to taste. Put about 1 1/2 cups of the fill mixture on half of each circle. Fold in half, and make sure the edges are secure. Place on an ungreased cookie sheet. Bake in an oven preheated to 375 degrees F for 40-45 minutes. Makes 8-9 pasties. To prepare the dough; in a large bowl, place 3 cups of flour. Stir in salt. Cut the butter into the flour using a pastry blender until the mixture resemble coarse meal. Add the ice water a little at a time until dough forms. If the dough becomes too sticky, add enough remaining flour so that it's no longer sticky. Make into a ball and wrap in plastic. Place in refrigerator to chill for 15-20 minutes. To prepare the filling; in a large bowl, combine all fo the filling ingredients, and mix gently until thoroughly combined. Preheat the oven to 400 degrees F. Lightly grease a baking sheet. Set aside. Remove dough from the refrigerator, and divide it into 6 pieces, rolling each piece into an 8-inch circle, about 1/8-inch thick. Place about one cup of the filling on half of the circle. Spread the mixture to within a half inch of the edge. Brush the edge with water and fold the top half over the filling. Seal and crimp the edges. Place on the prepared baking sheet. Repeat with the remaining dough and filling. Make a small slit about a half-inch long on top of the pasties. Brush with the egg and water mixture. Place in the oven. After about a half hour of baking, place a half a teaspoon of butter through the slit of the pasty in order to keep the filling moist. Bake for another 20-30 minutes, or until the crust is golden brown. To make the crust, cut the shortening into the flour mixture until it is the size of small peas. Add approximately a third of a cup of cold water. Mix with a pastry blender until the dough is blended well. Divide into two equal parts, and roll into 9" circles. Mix the filling ingredients together, and equally divide the mixture onto one half of each of the rolled crusts. Top with half of the butter on each. Fold the other half of the crust over the filling. Seal, folding and crimping into a rope-like edge. Slit each pasty about a half inch in several places. Place on a cookie sheet several inches apart, and bake in an oven preheated to 375 degrees F for one hour. Makes two pasties. In a large chilled bowl, combine the sifted flour and salt. Cut in shortening with a pastry blender or two knives until the mixture looks like coarse cornmeal. Rub the flour together with your fingers to produce a coarse crumb. Pour in ice water, toss, and gather into a ball. Add more water if necessary to hold the dough together. Divide the dough into 6 equal parts, and roll each of them into balls. Dust each ball with flour and wrap in plastic wrap. Chill for an hour. Trim the round steak of all excess fat, and cut it into quarter-inch cubes. Mix the steak with the cubed potatoes, the scraped and diced turnip or rutabaga, the finely chopped onion, salt, and pepper. Mix thoroughly so that the seasoning is well blended. Roll out each ball of dough on a lightly floured surface to a circle that is about a quarter of an inch thick. Place 1 1/2 cups of filling onto each circle, then fold over the other side. Pinch the edges of the dough together, enclosing the filling and forming a double thick band of dough along the seam. Moisten the edge of the seam and crimp into a decorated edge using your fingers or a fork. Slash a bent in the top so that steam can escape while cooking. Place on a cookie sheet, and bake in an oven preheated to 400 degrees F for 45-50 minutes, until golden brown. Combine flour and a dash of salt. Cut in shortening until the mixture resembles coarse meal. Slowly add water until mixture forms a sticky ball. With floured hands, shape into a ball, wrap with wax paper, and put in the refrigerator for an hour before preparing the filling. Preheat the oven to 350 degrees F. Combine all remaining ingredients in a large bowl, using hands to mix until thoroughly combined, like meat loaf. Divide dough into four equal parts. Using a rolling pin on a floured board, roll each into an 8-10 inch circle. Place a cup of filling in the center of each circle. Fold both sides up and crimp firmly, forming a half-moon shape. Use a large spatula to lift each pasty from the floured board, and set it on a greased cookie sheet. Bake 75 minutes, until brown. Cool for at least 15 minutes. Serve with gravy on the side, if desired. Yields 4 meal-sized pasties. In a large bowl, combine the flour and salt. Cut in shortening until the mixture resembles coarse crumbs. Stir in water until the mixture forms a ball. Shape into a ball, wrap in plastic, and refrigerate. Preheat oven to 350 degrees F (175C). Line a baking sheet with parchment paper. In a large bowl, combine the meat, potatoes, onion, rutabaga, and chopped carrots. Season with salt and pepper. Divide the dough into six pieces, and shape into balls. On a lightly floured surface, roll each ball into a 6-inch round. Place approximately one cup of filling on half of each. Dot each with a tablespoon of margarine or butter. Draw the other half of the pastry over the filling. Crimp edges to seal in the filling, and prick with a fork so that steam can ventilate. Place on prepared baking sheet, and bake for one hour. Put the flour in a bowl and cut in the shortening, lard, and suet. Add just enough water to make a soft dough. Divide the dough into four parts and roll each part into a circle about the size of a dinner plate. Crumble the meat into a bowl, and stir in the potatoes, onion, rutabaga, and carrot. Divide the mixture into four parts, putting some on one side of each piece of dough. Sprinkle generously with salt and pepper. Fold the pastry over the filling to make half-moon shaped pies. Seal the edges and cut a couple of small slits on the top. Bake on a cookie sheet at 375 degrees F for about 30-35 minutes, then reduce heat to 350 degrees F, and bake another 15 minutes. Make plain dough. For one pasty, take half the dough. Roll thin, shape and size of a pie plate. About one inch from the edge, pile half of the potato, onion and meat, and if desired one cup of diced celery. Sprinkle with salt and pepper. Lay the other half of the dough over this filling. Press edges together well and trim. Place two pasties in pie plate. Cut slit in top of each, into which drop one teaspoon of butter. Bake 3/4-hour in a hot oven (400 degrees F), or until well-browned, then reduce to 350 degrees F for fifteen minutes, pouring a teaspoon of hot water into openings occasionally to keep from drying meat. To prepare crust, mix salt into flour. Cut shortening into flour as in preparing pie crust. Add milk and mix to form a dough not sticky or dry. Divide dough into 12 equal balls and roll each ball into a 9-inch circle. To prepare filling, combine coarsely ground beef and pork; add salt. In separate bowl, mix together all vegetables and season with pepper. Combine all ingredients, mixing together well. Prepare crust by combining all ingredients and mixing together well. Separate dough into balls and roll each into a 12-inch circle. Place 1 cup of vegetable mixture in center of each circle, fold over and crimp edge. To prepare filling, peel and dice vegetables (some grind them) approximately the size of a Navy bean or a little larger. Mix vegetables and meat together thoroughly: let set 1/2 hour. Beat together eggs and milk. Brush the top of each pastie with the egg mixture and bake in preheated 350 degree F oven 1 hour. Yield = 40 (6-inch) pasties. Dice potatoes and onions, shave carrots. Prepare your favorite pie crust and roll out. Place vegetables on crust in order given. Add ground meat, if desired, and seasonings. Fold crust over, and crimp edges together to seal. Bake at 400 degrees F for approximately forty minutes to one hour, until crust is golden brown. Serve with gravy, butter, or nothing at all. Pasty fillings may be varied to meet your tastes - different meats, vegetables, etc. Great for a lunch pail while working out in the woods. Pasties may be wrapped in foil and frozen to be enjoyed later. On a floured surface, roll out four 8" rounds. In a large bowl, combine meat, potatoes, onions, chopped parsley, onions, salt and pepper. Mix well. Place about a quarter of the mixed ingredients on a rolled crust at about one inch from one side of the pastry. Place 1-2 tablespoons of butter, sectioned into small dallops, on top of the pile of filling evenly. Bring the remaining portion of the pastry round over the top of the filling to form a large turnover. Be careful that no sharp edges of the potato or onion punctures the folded side of the pastry dough. The folded-over pastry should meet the bottom part of the pastry just within the outside edge. Crimp the lower pastry up around the edge of the top to form the turnover, making a tight envelope for the filling. Make three or four small slits in the top of the pasty to allow the steam to escape during cooking. Carefully transfer the pasties to a very lightly greased baking sheet. Bake at 425 degrees for 10 minutes, then turn oven down to 325 degrees F, and bake another 50 minutes. Remove pasties from the baking sheet with a long spatula. To make the crust, mix the flour and salt. Cut in the shortening until the size of small peas. Break egg into measuring cup, and mix lightly. Add enough ice water to equal one cup and mix. Gradually add water to the flour mixture while tossing the mixture with a large fork until dough forms. The dough should be wet. Wrap it in plastic wrap and chill thoroughly, for an hour or more. Preheat oven to 400 degrees F. Grease one large or two small baking sheets; or line them with parchment paper or aluminum foil. To make the filling, toss the beef, potatoes, rutabaga, onion, 2 teaspoons of salt, and 1 teaspoon of pepper in a bowl. On a floured surface, divide the dough into 8 equal portions. Roll each into a ball. Roll out each ball into a 7-9-inch circle, using additional flour to keep the dough from sticking. Divide the filling onto the dough circles, leaving a 1 1/2-inch edge all along the filling. Place a piece of butter on the filling, and sprinkle with additional salt and pepper to taste. Hold the filling with one hand to keep it from falling out, as you fold the dough over the filling with your other hand to form a half-moon. Use extra flour if needed. Press the top edge onto the bottom edge all around the filling. Fold the dough edges toward the filling to seal tightly. Pasties will be lumpy, but avoid allowing the vegetables to poke through the dough. Place on baking pans. Brush each pasty with egg. Bake 20 minutes, then reduce heat to 375 degrees F, and bake until golden brown, 25-30 minutes longer.